Malone's Landscaping is a local landscaping company in St. Louis, which provides both commercial and residential landscaping services. The established company came to Silver Scope Web Design interested in increasing their web presence. They were looking for a landscaping website that would advertise their company and all of their landscaping services to customers throughout the local St. Louis area. 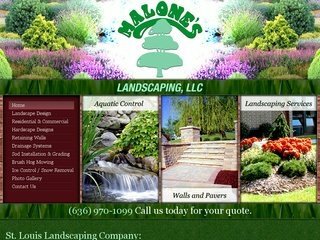 Because Malone's Landscaping offers a wide selection of landscaping services to their customers, it was our design team's goal to create a website that advertised these services while also explaining them in thorough detail. By providing custom, search engine optimized copywriting for each page, we were able to create a search engine optimized website that is ready to go to work advertising for the company and attracting new business.